We’re proud to help businesses throughout East Valley, Phoenix, and elsewhere in Arizona with the installation of Parking Lot Curbs and Commercial Curbing for their commercial spaces, including Heavy Duty Curbs and Parking Bumpers. 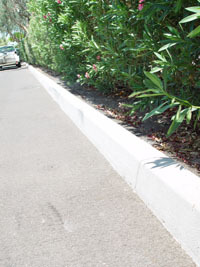 Our standard parking bumpers are reinforced and held in place with rebar pins and serve to both beautify your space and better manage your landscaping maintenance. Any commercial space needs to be well-maintained and attractive to your customers, clients, and business partners. Even non-retail locations that aren’t open to the public can benefit from the visual improvement of professionally installed Parking Lot Curbs and Commercial Curbing that improve parking services for customers and business partners and improve the look and feel of the overall property, which reflects directly on how your business is perceived. Our curb installations come in all standard and heavy duty sizes, including 6 x 6 x 8, 4 x 6 x 6, 8 x 8, 6 x 8, 6 x 6, and 4 x 8. Don’t make a poor impression on people forced to park in a disorganized lot or forced to wade through unruly landscaping where roots have broken through cheap barriers and edges have become messy and ugly. Concrete curbing is the best barrier to root infiltration in the world, and our assortment of available colors, textures, and shapes (including curves and turns) will improve any landscaping and bring your vision of what your business’s image should be to life. Affordable and durable, our curb products are a worthwhile investment in your company. 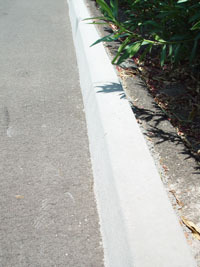 With a standard 2 year warranty against cracking (with proper maintenance), our concrete curbing will last for years, keeping your property looking neat and professional through all manner of weather and keeping your parking lot safe and orderly for both employees and customers or clients.